This course was developed in response to some of the Active Schools teams in Scotlands (similar to School Sports Co-ordinators in England) who wanted to be able to run Circus Skills Workshops themselves as part of the regular Sporting Activity sessions when they visit the schools they are responsible for. These sessions have resulted in many schools and Children’s organisations getting regular Circus Skills sessions courtesy of the local Sporting Authorities and even community chests of workshop equipment available for them to use (purchased through my Juggling Store at a discount). Workshop Size: Between 5-15 participants is a good workshop size in order to be able to answer questions as fully as possible and make sure everyone gets plenty of one-on-one tuition and feels fully empowered to know exactly how to carry out Circus Skills Workshops for their own situation. Ages: This seminar is aimed at adults/people who intend to run workshops or want to learn how to best teach others Circus Skills. Cost: Please contact me and the price will be provided! You could use the enquiry form at the bottom of this page! How long is the course? : There are 1 day (5hr) or 2 day (2 x 5hr) sessions available. The 2 day seminar would be the option that the participants learn the most from, but it is understood that many staff can’t devote 2 whole days to training which is why the 1 day session was created! The 1 day (5hr) course is a lot more condensed with less time spent on practicing with the equipment. Participants will still learn how to run Circus Skills sessions and gain basic skills using most Circus Skills props, but they will need to keep up practicing in their own time to gain the skills they would have learned with an extra 5hrs of training alongside someone to help them improve! Top-up skills workshops are also available (these are just the usual Circus Skills Workshops but to help people advance to the next level with their chosen props), so that the participants can learn new skills when they are ready to be enthused all over again and inject some new energy into their sessions that they are now hopefully running! Learn Ball Juggling. You will find that many workshop packs contain several sets of balls, rings, clubs and scarfs, so if the participants do not learn how to juggle a basic cascade pattern, up to 50% of a workshop pack may remain unused, so this skill is essential! There are plenty of in-depth handouts covering all of the above discussion points to act as a reminder for once the course has finished, but you are welcome to take notes if you wish! * This session contains a handout about how the participants can themselves train other leaders to run Circus Skills Workshops. 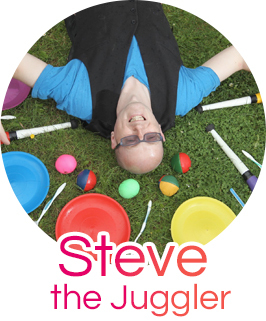 Having this extra add-on means that the equipment is more likely to be used as you will have the ability and knowhow to train other people in the joys of juggling! Please make sure that they are prepared to put in some practice and learn the skills before they run a session though! Special reduced rates for organisations when bulk purchasing workshop packs – please visit my online store.